Great, now we're too terrified to take this out of the printer. 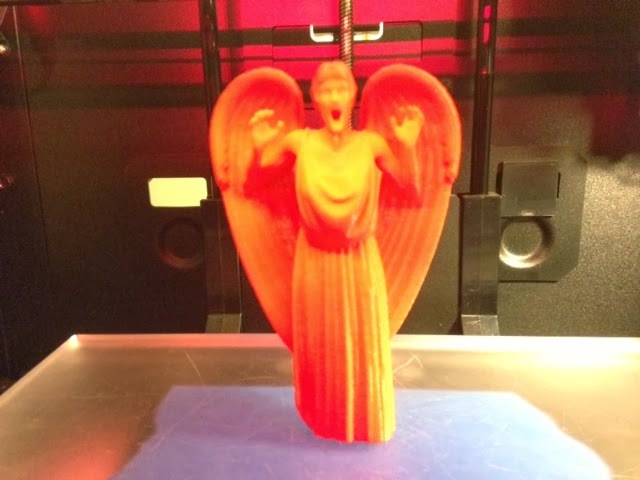 This beautiful and horrifying model is fantasygraph's Dr. Who Weeping Angel on Thingiverse. We printed it in honor of the Day of the Doctor, and in particular for the joy of seeing David Tennant play the Doctor just one more time. Settings: MakerWare .2mm/standard settings in about 3 hours. Stuff to change: The robe collides with the wings in the back of the model. Possibly this will be fixed later by fantasygraph?